The shared themes of the first three texts (Zephaniah 3:14-20, Isaiah 12:2-6, and Philippians 4:4-7) for this week speak more clearly to children than does any particular text. So, I’m making thematic rather than scripture-based suggestions for all except the gospel reading. The theme is that even when things look really bad we can rejoice and trust God because we know that in the end God’s loving power will win. 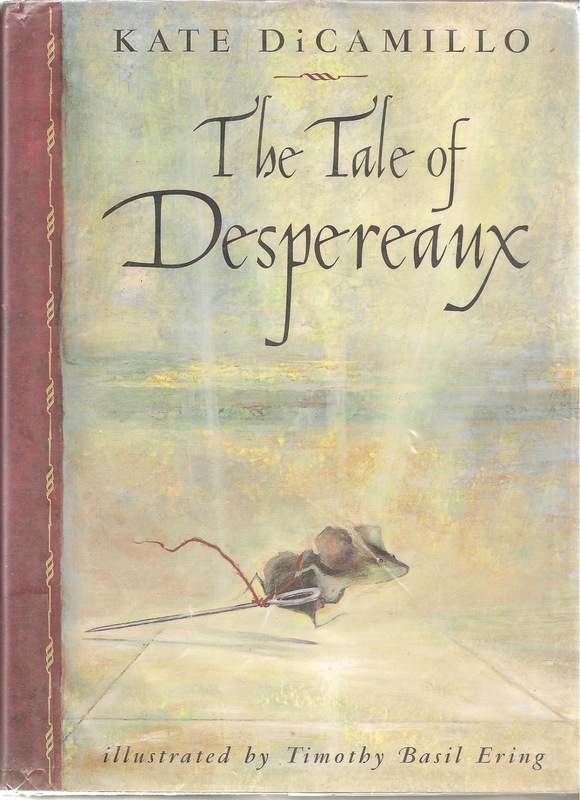 In Chapter 11, Despereaux the mouse has been condemned to the dungeon and probable death by the rats there because he has proclaimed his love for the beautiful human princess. As he ties the required red thread around Despereaux’s neck, the threadmaster whispers to him about his princess story and suggests that Despereaux be brave for his princess. 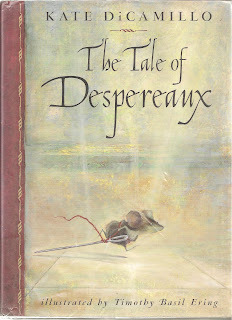 Despereaux decides to do so and sets off bravely for the dungeon and to rescue the princess. Read the whole chapter in 4 minutes or select excerpts with which to explore the importance of having stories in which you believe to help you face tough situations. Chapter 27 is a conversation between a young, not very bright servant girl named Mig, who is another underdog in this book, and her owner whom she must call Uncle. Mig describes the princess she saw on the road and wishes that she could be a princess. Uncle mocks her wish and concludes “’Besides, who ever asked you what you wanted in this world, girl?’ The answer to that question, reader, as you well know, was absolutely no one.” The whole chapter/conversation can be read aloud in 2 minutes. Children (and adults too) empathize with Mig’s situation. Most have felt as unwanted and in need of a new life as she does. *** To explore the close connection between fear, sadness and joy, create two round posters (maybe two paper plates). On one plate draw a fearful emoticon on one side with a rejoice emoticon on the reverse side. On the second plate draw a sad emoticon on one side with a rejoice emoticon on the reverse side. Insist that it is easy to think that fear, sadness and joy are three separate feelings or plates, but that they are not. Because we know that God is with us in even the scariest and saddest times and that God’s loving power will win in the end, we can rejoice when we are scared or sad. That idea stretches the understanding of most children, but is worth introducing so they can begin to work with it. *** The animated movie “Inside Out” depicts five feelings (joy, sadness, anger, fear, and disgust) working together to guide an eleven year old girl through her daily activities. Each of the feelings offers important gifts with joy predominating. Younger children who may have been taken to the movie because it was animated probably did not get it at all. But, older elementary school children, especially the girls, probably understood – at least a little bit. Refer to the overall plot in a sermon to help children get the biblical message that we can rejoice even in scary or sad times. *** Lighting the Advent candle: If you use a pink candle in the advent wreath, briefly explain that it is the joy candle. (ASIDE: The candle is NOT pink because we hoped it would be a girl as one wit suggested!) 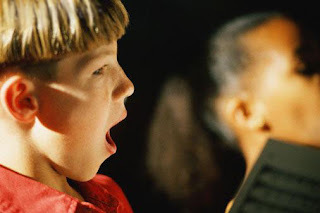 Ask members of a choir (maybe a children’s choir?) or the worship committee to light the candles this week. Look for another set of reading tied to the gospel this week. Statement to read while lighting the candle: God, sometimes the world feels dark and evil. We light the third candle of the advent wreath today to remind ourselves that you are with us every day and love us with a powerful love. So, even when things are awful, we can rejoice. At the end of the service an acolyte lights a candle from the third candle in the wreath as a worship leader charges the congregation: Go out this week to face whatever scary or sad things that come your way knowing that God is with you and that God’s powerful love will win in the end. So, Rejoice and God in Peace! If you are using the crèche to rehearse the nativity story in the sanctuary, bring the Magi to the manger. Contrast them to the shepherds. The magi knew they were important and smart people. But when they saw that God was doing something important, they dropped what they were doing and traveled a long way to see what was going on. They were excited to know that God was doing something new and wanted to be part of it. “O Sing to the Lord!” includes three verse of simple, repeated words set to a Brazilian folk melody. Children enjoy the addition of a trumpet interlude before the last verse, “dance for our God and blow all the trumpets.” For extra exuberance add streamer twirlers when this song is sung as the processional or recessional. 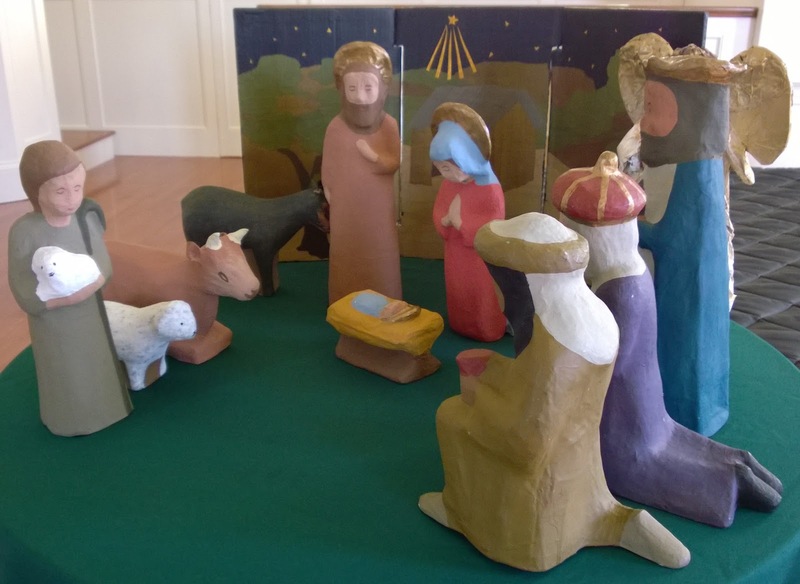 Sing “Dona Nobis Pacem” as a round at the call to worship before you explore the day’s theme. Then sing it again at the benediction reminding worshipers of what they now know about peace and joy. If you project songs to sing, try this “Go Now in Peace” as a benediction. Why can we sing “Joy to the World”? 1. No matter how bad things might be at the moment, “The Lord is come”, i.e. God is with us. 3. Given that, we don’t have to get upset in our sorrows or caught up in all the bad stuff that happens. 4. And, like all good last verses, this one is the summary. We can rejoice and sing “Joy to the World!” because God rules the world with truth and grace. *** Many congregations have become sensitive to people for whom it is hard to rejoice at this time of year. Remember that this group includes children as well as adults. 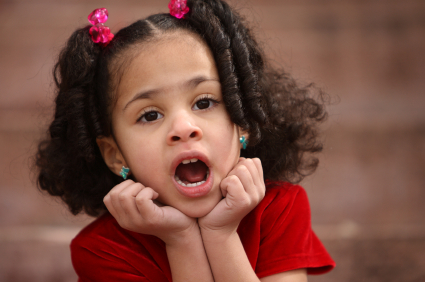 Children face the same problems that daunt the adults, but do so with different twists. 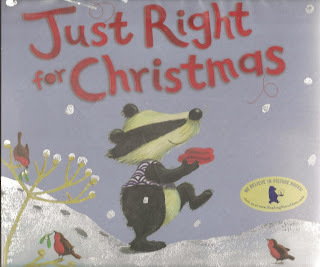 For one thing, they lack the experience of many Christmases that the adults can draw on to keep a sense of balance. For another, they feel that as a child they should be totally into the season. It feels even more unfair to them than to the adults that they are not going to have special gifts or fun family gatherings or decorations or….. They need to hear that rejoicing in happy times looks and feels different than rejoicing when times are hard, but the latter is still very good and important. *** If you have a Chrismons tree, help the children find ornaments that are stars or have stars in them. Explain that stars are happy, rejoicing lights. No one ever sees a star and says, “Rats! 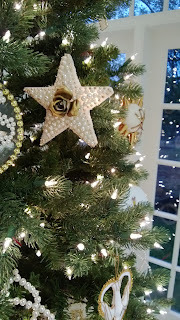 Who needs a star?” Star stickers are used for decorations. You never get a star sticker and a frowny face sticker on the same paper at school. Recall, if a child doesn’t beat you to it, the star of Bethlehem and describe it as proof that God’s light was coming into the world. *** The RCL schedules Luke 3:1-6 for the second Sunday of Advent and verses 7-18 for the Third Sunday of Advent. I (and lots of scholars!) think at least some of these verses really belong together. Begin by reminding worshipers of John the Baptist as you met him last week. Then, point out that when John grew up huge crowds followed him. Invite the congregation to join you in reading about John and those crowds. Assign different sections of the congregation to be the crowds, tax-collectors, and soldiers. The Narrator, who is probably the key liturgist, and John read from the front. Everyone will need a script. Prepare John to read dramatically as if addressing a large crowd out doors. John: Turn back to God and be baptized! Then your sins will be forgiven. ‘Get the road ready for the Lord! and level every mountain and hill. and smooth out the rough roads. John: You bunch of snakes! Who warned you to run from the coming judgment? Do something to show that you really have given up your sins. Don’t start saying that you belong to Abraham’s family. God can turn these stones into children for Abraham. An ax is ready to cut the trees down at their roots. Any tree that doesn’t produce good fruit will be cut down and thrown into a fire. The crowds: What should we do? John: If you have two coats, give one to someone who doesn’t have any. If you have food, share it with someone else. Tax-collectors: Teacher, what should we do? John: Don’t make people pay more than they owe. John: Don’t force people to pay money to make you leave them alone. Be satisfied with your pay. John: I am just baptizing with water. But someone more powerful is going to come, and I am not good enough even to untie his sandals. He will baptize you with the Holy Spirit and with fire. His threshing fork is in his hand, and he is ready to separate the wheat from the husks. He will store the wheat in his barn and burn the husks with a fire that never goes out. Narrator: This is the Word of the Lord! *** Advent wreath lighting: Invite deacons or those people who take the lead in providing food, shelter and clothing locally to light the wreath if the focus is on John’s instructions for repenting. 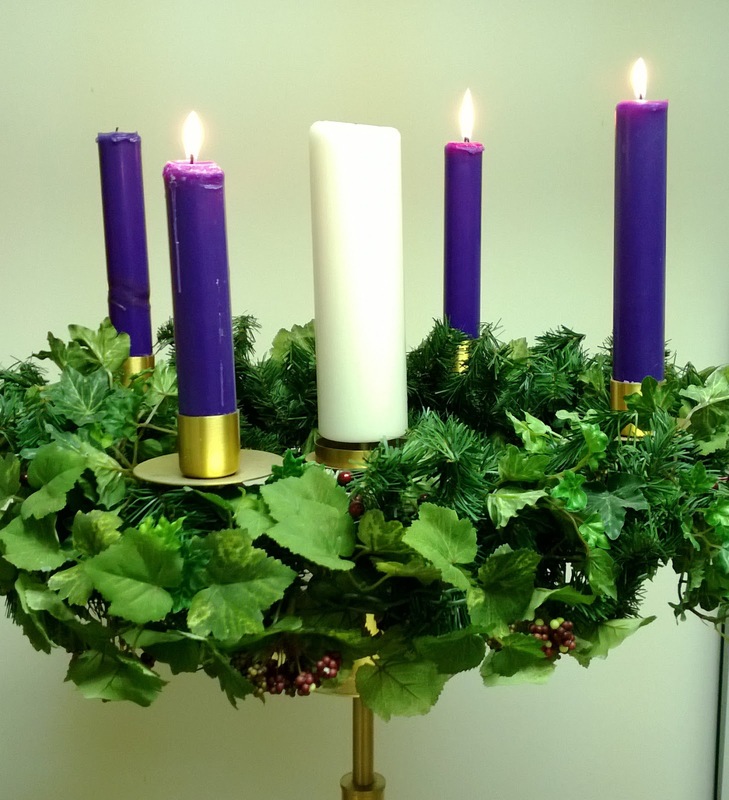 Statement when lighting: God we light the third candle of the Advent wreath promising to repent, to share with those who need more, to be more honest and fair, and to use our power to love people rather than get what we want. Help us make the changes we need to make to be your loving people. At the end of the service an acolyte lights a candle from the third candle in the wreath as a worship leader charges the congregation: Go out this week to share what you have with those with big needs, be honest in everything you say, be fair to everyone you meet. It will not be easy, but remember that God will be with you and God’s powerful love with work in you. So, go in peace. *** Connect John’s instructions to the Old Testament text calls for trusting God, by pondering what do we do because we know that God is with us and God’s power will win in the end. This year the forgiveness offered by the families in Charleston to the man who killed the people they loved is one example. 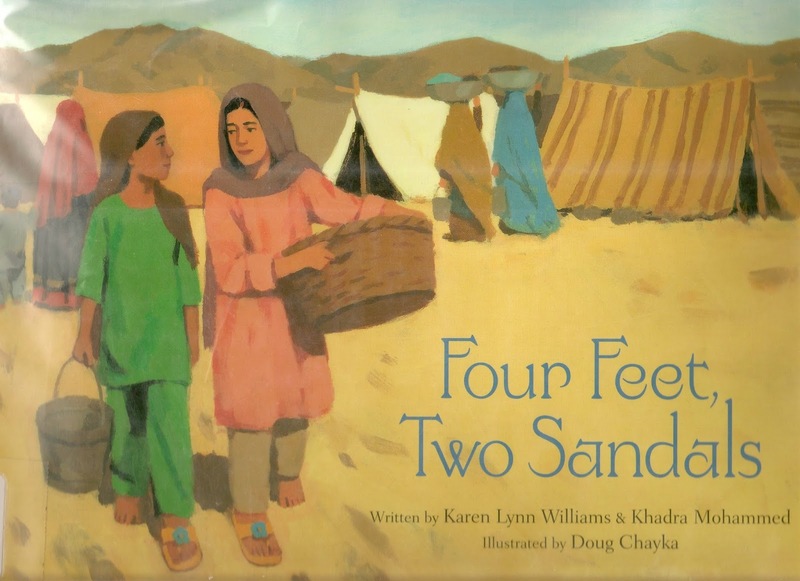 For another example, read Four Feet, Two Sandals, by Karen Lynn Williams and Khadra Mohammed, which describes how two shoeless refugee girls scrambling through a pile of second hand clothing each find one yellow sandal with a blue flower on it and choose to share them. *** Think like John. Make up “what shall we do”s for a variety of groups today. If children converse easily on the steps, together make a list for children adding to the phrases below. In addition make up some for current youth and adult groups maybe as part of the sermon. Big brothers or sisters,…how do you treat your younger siblings? Little brothers or sisters,… how do you treat your older siblings? Friends… how do you treat your friends and others? *** Repent is John’s favorite word. He used it lots! It underlies each of his conversations in today’s story. To help children understand and claim the word, write it in big bold letters on one side of a poster and write “sorry” in small letters on the reverse side. Point out the difference in being sorry and repenting. Being sorry is feeling bad that you did something wrong or hurt someone. Repenting is doing something to make sure you never do that again. Repenting is making changes in what we do. It is much easier to feel sorry about something than to repent it. John is not even a little interested in people feeling sorry about bad things they were doing. He wanted them to change. He would want the same for us this Advent. After talking about repenting, challenge children to draw or write about repenting they plan to do in the coming weeks. Invite them to put their art in the offering basket as a way of offering it to God and asking for God’s help. *** To explore John’s call to repent and be baptized, explore the question “Do you renounce evil and turn toward Jesus Christ?” in many baptism and confirmation rituals. To describe how we actually do this, sort a collection of cards or small posters into “evil” and “turn to Jesus” piles. Write on each card something like Mine!, I want it!, Give me! Me first! You stink! May I help? Can we share this? What would you like? You first! I think you are special! Can we do this together?... Briefly describe that working to say or not say each of these things is a way of keeping a promise to God. *** Before singing “Prepare the Way” (written by Franz Michael Franzen, adapted by Charles P Price), introduce Zion simply as a code word for God’s people. The first line thus is “Prepare the way, God’s people, Your Christ is drawing near.” Then point to and read or even practice together the Refrain. With this help older elementary children can read the words and get the meaning of most of the hymn. Thanks for the idea to use "inside out". it was just the spark I needed to move out of "children's message writers' block"!